65 x 54 x 6 1/2 in. 62 x 54 x 3 1/2 in. 60 1/4 x 48 x 3 1/2 in. 30 1/4 x 42 x 3 3/4 in. 47 x 56 1/2 x 2 in. 43 1/2 x 32 x 5 1/2 in. 17 1/2 x 62 in. 72 x 60 x 3 in. 11 3/ 8 x 16 3/4 in. 16 3/4 x 11 3/ 8 in. Thursday, November 2nd, 6:30pm. Reception to follow. This October DC Moore Gallery presents, Joyce Kozloff: Girlhood, an exhibition that unites the artist’s ongoing mixed media cartographic art with recently unearthed childhood drawings. Kozloff discovered folders containing her carefully preserved grade school art during the emotional process of packing up and closing her parents’ house after their deaths. Her occasionally phantasmagorical and meticulously painted archaic charts offer a dialogue between the youthful wonderment preserved in her elementary school drawings and adult geographical knowledge. These works bear a riveting similarity to her oeuvre of the last 25 years – maps, charts, decorative flourishes, information organized in graphs, and vignettes that expand the worlds depicted. The worldview of my naïve public-school pictures is further away from me today than the places were then. False scenarios about other times unraveled for many in my generation, although not everywhere nor for all Americans. And that’s why my conventional grammar school innocence feels weirdly relevant to me - within our polarized society, where so many people hold onto fantasies about recovering an imaginary past. Halfway through the Girlhood project, Kozloff began a group of “satellite paintings,” in which she re-drew and re-contextualized her youthful drawings, inventing new scenarios for her subjects without the structure of the antique maps. To simulate the sketchy surfaces of the originals, she utilized children’s art supplies: chalk, crayon and craypas. Upon the sides and across the tops of some pieces, she attached foreign dolls – sweet, goofy 1950s cultural stereotypes, also rescued from her early home – that bring playfulness into her work, contrasting the gravitas of the first series. Girlhood will also present fifteen collages from Kozloff’s 2001-2002 series Boys’ Art, which set a precedent for her combining pre-adolescent drawings with vintage maps. After the 9/11 attacks, she began a series of detailed drawings of historic battle sites. As these works developed, she added copies of her son’s childhood superhero and war drawings. Excerpts from art history and popular culture enliven the work – warriors borrowed from Goya, da Vinci, Picasso, Hokusai, Plains Indians, Henry Darger and others. Together, Girlhood and Boys’ Art juxtapose artifacts of childhood, framing the development of gender identities. 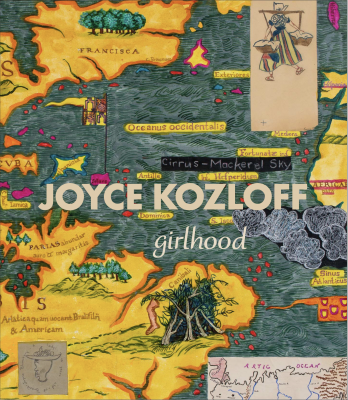 Joyce Kozloff has been an activist in the feminist art movement since 1970. She was a pioneer of the Pattern and Decoration movement of the 1970’s and 80’s and a founding member of the feminist collective Heresies. After a sustained commitment to public art throughout the 1980s and 1990s, she returned to a studio practice that encompasses painting, sculpture, installations, printmaking, and photography. In 2016 Kozloff was commissioned to create a print, Waves II, to commemorate the opening of the Met Breuer. Kozloff is currently working on a commission for the MTA Arts & Design Program. Kozloff’s work is included in public collections such as the Brooklyn Museum of Art, NY; Los Angeles County Museum of Art, CA; Metropolitan Museum of Art, NY; Museum of Modern Art, NY; National Gallery of Art, Washington, D.C.; and Whitney Museum of American Art, NY. A catalogue with an essay by Patricia Hills and an interview with the artist by Chris Lyon will accompany the exhibition. For press inquiries please contact Peter Colon at pcolon@dcmooregallery.com or 212-247-2111. 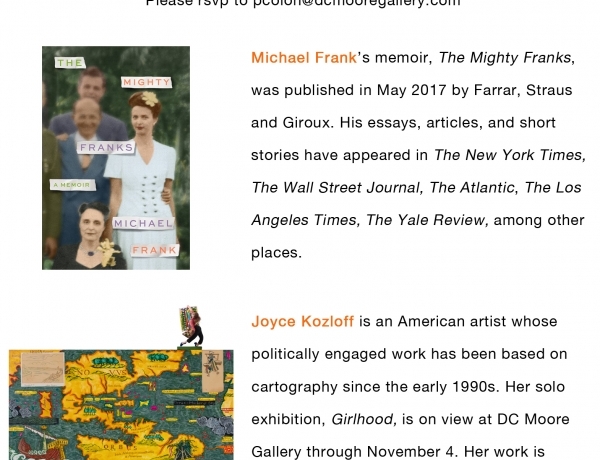 Joyce Kozloff: Girlhood | DC Moore Gallery from DC Moore Gallery on Vimeo.